Cold Jet Aero 80FP Dry Ice Blasting Machine - Premium technology. Proven design. 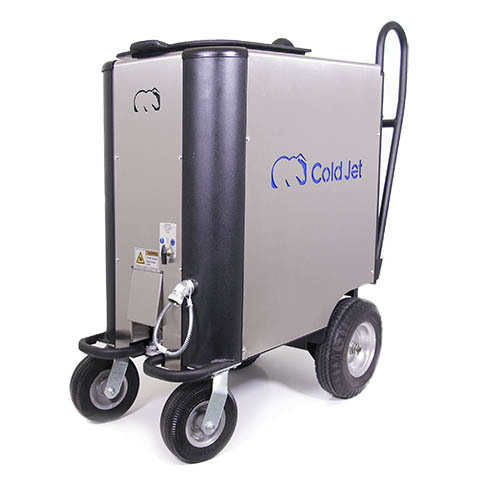 Cold Jet's top-of-the-line machine, the Aero 80FP is a full pressure dry ice cleaning system that includes brand new radial feeding system technology with aerodynamic loading to reduce wear on pads and rotor; utilizes a compact motor that reduces weight and lowers power consumption; includes an enhanced rotor that provides pulse-fee blasting and precision feed rate control; and has an onboard pressure regulator. Customized with accessories that will provide the best clean for your environment, the Aero 80FP provides premium technology in a proven design.